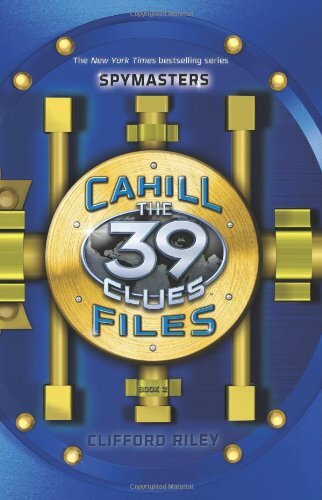 In The 39 Clues: The Cahill Files: Spymasters you receive three amazing adventure stories from the Cahill vault! Read at your own risk. In 1814, redcoats burned the White House to the ground. In 1889, Harry Houdini discovered a trick that would save his life. In 1955, the U.S. launched the world's first nuclear submarine. And one family pulled the strings behind the scenes at each of these events: the Cahills--the most powerful family the world has ever known. Now the Cahills have opened their vault and dangerous secrets are pouring out. This volume contains three stories previously-published as ebook adventures, THE REDCOAT CHASE, THE SUBMARINE JOB, and THE HOUDINI ESCAPE, three stories that will change history as we know it forever. Flee alongside a young Cahill as Washington burns, unlock Houdini's magic, and stow away with young Fiske Cahill on a desperate mission that could cost him his life. Venture into the vault if you dare. But don't say we didn't warn you. My daughter just started to read the 39 clues books and has been completely intrigued by them thus far. This book was different than other ones, but different in a good way in my perspective. In this book you get multiple stories, making the book three for the price of one. In each of the stories though you still get the same adventure, mystery and suspense that we have become accustomed to. As my daughter loves mysteries and being her own detective, these stories were perfect and each were fun and engaging. We had a blast reading them together and we highly recommend the book to any existing fan of the series, or anyone looking for a great story - you will not be disappointed!